From January 14th we are now donating all proceeds from sales of the snood pattern to Whittingham Kennels Retired Greyhound Trust. The kennels rescue ex-racing greyhounds and find them new homes. They have cost of running the kennels, as it operates only for the purpose of rehoming, as well as extra costs for transport and veterinary fees. We adopted our Harry from the kennels who were enormously supportive when we lost Dizzy last year. Going to the kennels and meeting new hounds, and realising life has to go on for other furry boys and girls despite us grieving heavily for our boy has helped us get through a difficult time. We fostered Harry when the kennels needed to get a new roof to remove absestos and we fell in love with him. The kennels are beautifully clean and airy, and lots of natural light for the dogs. There are small stalls with a large bed lined with paper and fabric to make them cosy. The stalls/individual kennels have a half door so the dogs can stand up and have a nose out, to see who is visiting and what is going on in general. When the dogs have a medical problem they are taken promptly to the local vets. And to top it all, the kennels have beautiful surroundings of quiet Essex countryside and walks. There are grassy ( a bit muddy in this weather though) paddocks and the dogs are regularly allowed to run in their paddocks and stretch their legs. So why would a dog want to leave such a beautiful place? Well, firstly, however nice the kennels are they do not have a sofa, beds or other furniture normally in houses. And the dogs do want to be part of a family and not have to share the humans attention with 40 or so other dogs. They also want to have walks with the same people and build up to perhaps one day being trusted and trained enough to let off the lead. They want to drape over owners that belong to them and them alone (well perhaps to share with another pet or two) and watch TV with them in a lovely centrally heated house. And they want to go to exciting places, hang their noses out of car windows, go on holidays and visit beaches, get cuddles from all their owners' friends and extended family too. Finally tests are done, and the pattern is up for this earflap hat. I made this one for me rather than just wanting to design to get a pattern. 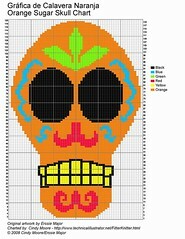 However, I knew folk would like the more floral theme of this sugar skulls hat so it is worth providing a pattern. 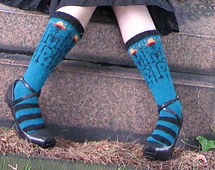 It can be downloaded from Ravelry, or directly from here. One of my favourite sabbats is Samhain. 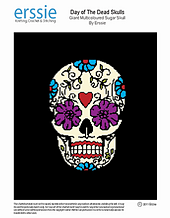 As you have probably guessed I love to design knitwear that celebrates this time of year including a lot of Dia de los Muertos designs. I am working on two Halloween patterns at the moment but as the hand disability has stopped me from working speedily they are nowhere ready to release. 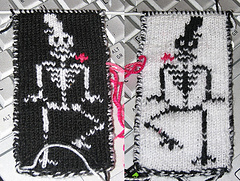 One design is my Day of the Dead throw and the other I started on a whim last night and is an earflap hat with sugar skulls and flower borders. 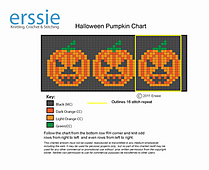 So to make up for my slowness I am rereleasing the Halloween Pumpkin Chart free of charge and if knitters are Speedy crafters they might just be able to use this border and make something for tonight. 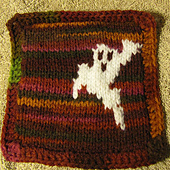 I also have a large number of other charts and patterns that fit the season on Ravelry.